Now, Astoria wasn’t our first choice of areas to stay in. We had ideally wanted to be on Manhattan itself but with so little time before we travelled, the available apartments were silly money. I read the reviews of this apartment in Astoria and decided they were good enough for us. We booked it immediately and, although it was a little over budget, we were at least guaranteed our booking. Lesson learned. Always go for the ‘Book Now’ option, not the ‘Contact Host’ option. We flew to New York on September 18th and although we arrived before the check in time, our host Jada allowed us to drop our bags off. She went through the building and apartment rules before we took our keys and headed straight for Times Square. I’ve written all about our New York holiday, but thought I’d let you know what our apartment in Astoria was like. We booked a 2-bedroom apartment, mainly so that I could sleep with BattleKid as he had only just moved into a big bed. It also let me escape my husband’s snoring! 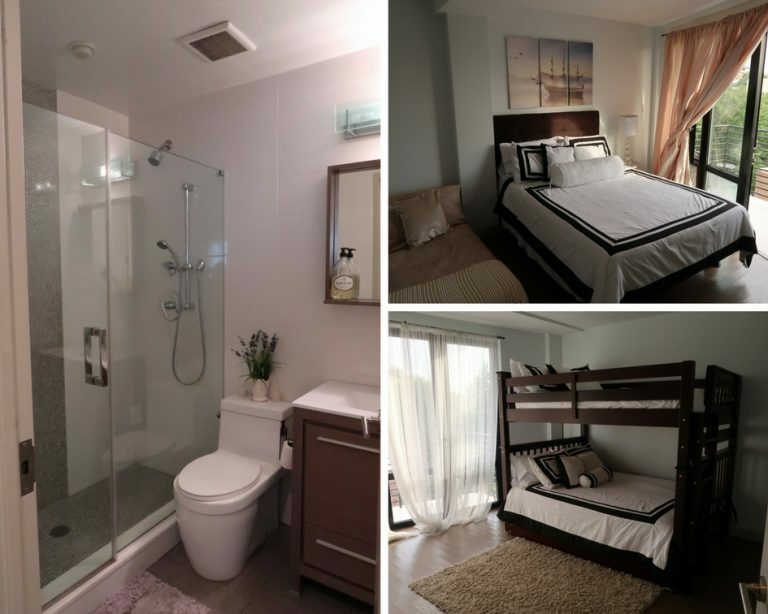 Located in Astoria on Astoria Boulevard, this modern 2 bedroom apartment will sleep up to ten people. Initial thoughts were it was a very clean, modern apartment, well decorated and would set a New Yorker back a fair few pennies to buy it! You enter a lovely little hallway which leads into the open-plan living room, dining room and kitchen. The living room is comfortable, although only had one sofa which would seat three people. Additional people would have to use the dining chairs, although you couldn’t be spending a lot of time in the apartment. The living room also had air conditioning and cable TV. The kitchen was well equipped, with everything you’d need for a city break. There was even a kettle, which Jada said previous guests had insisted she get. We’d have been happy boiling water for our tea on the hob. There are two bedrooms in this apartment in Astoria. The main bedroom had a queen size bed with a sofa beside it. We made this up as a bed and pushed it beside the queen bed for BattleKid. The main bedroom had a small built in wardrobe and gorgeous floor to ceiling windows which lead to a balcony. You could see the Manhattan skyline from the balcony. The second bedroom had not one, not two, but three queen beds, with an additional queen air bed in the huge walk-in wardrobe. The three beds were configured in a bunk-bed type style and I’d never come across anything like it before, but was brilliant. This bedroom also had floor to ceiling windows and a balcony on which to view the Manhattan skyline. The bathroom was modern and had a huge shower. There was also a cupboard with a washing machine and dryer, handy if staying longer than a few days. You also have access to a lovely roof terrace for viewing the Manhattan skyline! The apartment in Astoria was also well located near an underground station with a direct line to Times Square. That ride takes less than 20 minutes. There are bars, shops and diners nearby for food and drinks, and plenty of take-aways around which will deliver to your door via apps such as Seamless or Yelp Eat 24. My personal favourite was the Starbucks on the corner of Astoria Boulevard and 21st Street. As for our host, Jada, she was lovely. She was very welcoming and accommodating. As we’d arrived early, as mentioned, she let us drop our bags off and collect the keys before we headed to Times Square. When we got back she had kindly put our bags in a wardrobe and hung up our coats! When one fire alarm kept beeping all night (the battery was going), causing BattleKid and I to take solace in BattleDad’s room, she responded to my message very quickly and helped us sort it out. Jada was a lovely host. Our stay cost us £213 per night. This is quite expensive but as we were let down so close to our trip, it was the least costly option short of staying in a hotel room. And hotel rooms are not an option for us. They are a last resort for us or booked out of necessity! 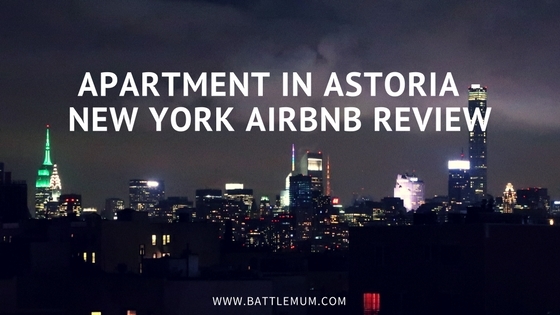 Here’s a tour of our apartment in Astoria. 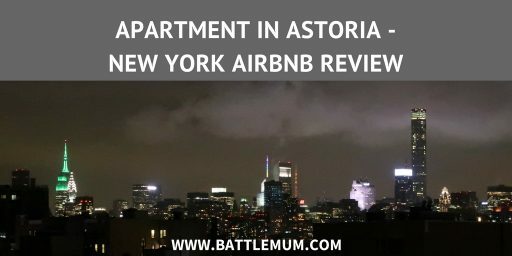 As an area to stay when visiting New York, I’d never considered Astoria but would definitely stay there again as its location for both Manhattan and JFK airport was ideal. Have you visited New York, and if so, are there other areas we should consider for our next visit? 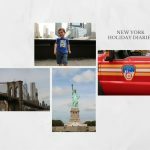 And if you are planning a visit to New York with your kids, why not check out my post about 5 Things to Do in New York with a Toddler in Tow and the Manhattan Top 10 with Kids by Our Globetrotters. And if they don’t convince you to visit New York, then check out the amazing pictures in Sorry About the Mess’ Winter in New York post. And you might want to consider getting a New York City Pass too! *The listing for this apartment is no longer on AirBnB at the time of writing this review. **I was not asked to write this review. To remain fully transparent, this post contains two affiliate links. This means that if you make a purchase after clicking through the link I will receive a small commission, at no extra cost to you. 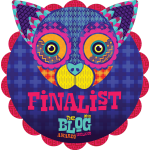 This helps support my blog. Thank you. What to pack for 3 days in New York. The air bnb sounds just perfect for you and your family. 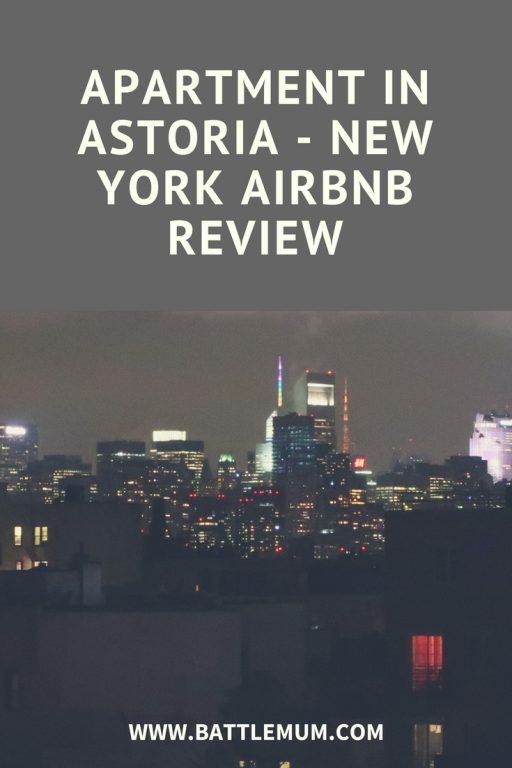 I’d love to visit New York one day and will definetly consider Astoria now I have read your review. 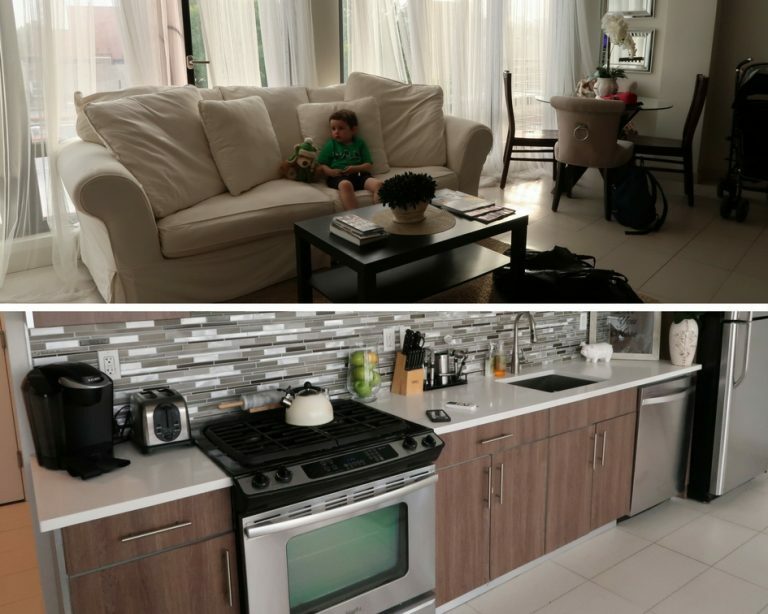 The apartment looks so lovely, loved the video! Such a pity it isn’t on Airbnb anymore! Yes, it was a great place to stay. Oh wow what a nice place to stay. I’ve never used Air B&B but would definitely give it a go, especially when you’ve got kids to think about. I always check AirBnB whenever we are planning holidays or a getaway. I’ve already booked three places via AirBnB for two holidays for next year and will be checking it out for two more holidays! Nice find! We always try to go for apartments rather than hotel rooms with the kids. It’s just so much easier, isn’t it! AirBnB is my go-to place for accommodation for any holiday or break we plan! What a shame you were let down by the first place. This apartment looks perfect for a family though, it must have been great to have so much space. So much better than staying in a hotel with kids. Omg the stress poor you. However looks like you found a gem here, it looks beautiful. Sometimes things happen for a reason!